South-bound sandhill cranes and Canada geese are decimating experiment plots and barley fields at the Fairbanks Experiment Farm, located on the University of Alaska Fairbanks campus. Over 400 cranes and 100 geese visited the Fairbanks Experiment Farm the morning of Aug. 18. The combination of massive flocks of wildfowl and a late ripening of grains is causing quite a conundrum. "It's a mess," said experiment farm worker Charles Ashlock. "Last year we had drought and this year rain. But you can't control the weather." In National Weather Service observations at the farm this summer, June had 3.97 inches of rain, July 5.43 and August (up to Aug. 18) 1.54, totaling 10.94 inches to date. The normal average for June in Fairbanks is 1.67 inches, July 2.52 and August 2.13. June had 18 days of rain, July 11 and August 14 so far. The cool, wet conditions have kept the grain from ripening as it should. Usually, the farm crew would have harvested the grain prior to the birds' arrival in the Interior. Charles Ashlock makes loud noises with a starter gun, hoping the visiting wildfowl will go elsewhere. The birds are not harmed. Ashlock visits the fields three times a day to shoot a starter gun, hoping the loud noises from firing off "bird bangers" will send the interlopers scurrying to Creamer's Field Migratory Wildlife Refuge, where a bounty is spread deliberately for them. Meanwhile, some determined and wayward fowl obviously prefer the vittles at the UAF farm and Fairbanks International Airport. The two entities are in frequent contact with each other this time of year about the status of the unwelcome visitors. Birds have trampled grain plots at the Fairbanks Experiment Farm. For the past two weeks, thousands of cranes and geese have stopped by the farm, chowing down on the barley intended for the research reindeer herd and grain plots where varieties of wheat, barley, oilseeds and oats are tested. 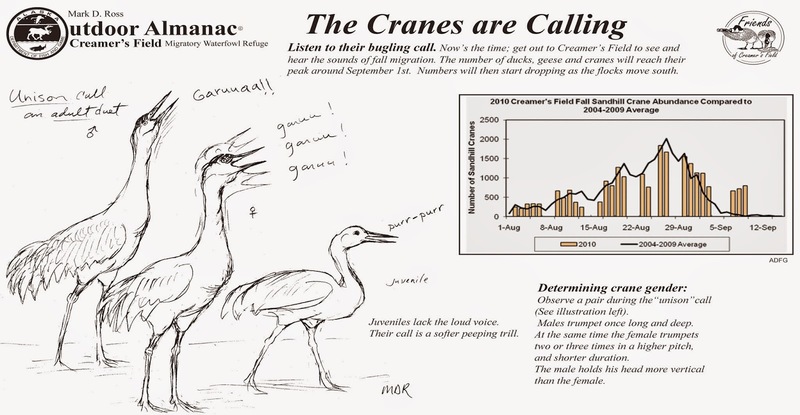 The cranes' trampling effect has also been detrimental. The farm produces 90 percent of the components crucial for the reindeer herd's nutritional needs and any decrease in crop production will have a financial impact, said Reindeer Research Program Manager Greg Finstad. "Whatever the cranes eat we won't have to meet our annual feeding needs and we will have to buy." "We usually start counting birds Aug. 15 and we've been counting here since Aug. 5," said Fairbanks Experiment Farm Manager Alan Tonne. "We've had a phenomenal number of birds early on. It's usually Aug. 25 before we have large numbers of birds but it fluctuates." "They are hammering the grain," Ashlock said. "They are wiping out entire corners of the fields. That's our battle right now."